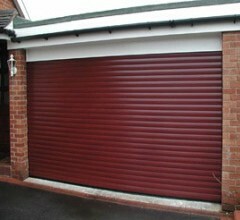 Essex Roller Shutters offer a comprehensive range of doors, shutters, gates, grilles and awnings in all areas including Clacton Colchester and Basildon and designed and manufactured to provide an effective security and environmental solution for all types of domestic residential premises. Our products are generally bespoke to your requirements, they are purpose made to suit your opening dimensions and fully guaranteed for a minimum of 12 months. 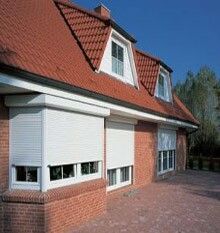 Below are a selection of the different types of domestic doors, shutters, gates, grilles and awnings available. Insulated Roller Garage Doors are an attractive secure and affordable alternative to traditional Up & Over Garage Doors and provide the maximum usable space within the garage and often able to accommodate high-roof 'off road' type vehicles and MPV/People Carriers. The Curtain is manufactured from strong corrosion resistant, maintenance free 77mm x 18mm thick double skin aluminium interlocking lath sections with a cfc free insulated core providing an acoustic and thermal break with a high quality factory applied finish in a choice of 15 colours and 7 specialist wood-grain effects. Driven by a 240v tubular motor drive unit, the doors are fitted as standard with manual over-ride facility in case of power failure, a high security Rolling-code Remote receiver unit, two key-fob transmitters, an inertia anti-fall safety device, an obstruction safety device (photocell), auto-locks and colour finish in a standard range colour. If additional security is required, the door is also available in 77mm Steel interlocking lath sections with a choice of 16 colours and 1 specialist wood-grain effect. Where headroom is restricted we are able to offer a Compact option which requires as little as 205mm headroom and is constructed from 52mm double skin aluminium interlocking lath sections in a choice of 9 colours and 2 specialist wood-grain effects. Domestic Roller Shutters are available constructed from either cfc free Foam-filled double-skin slats where thermal and/or acoustic values are required or Extruded aluminium double-skin slats where security is of greater concern. They are both generally operated electrically via a 240v single-phase electric motor unit with a manual override mechanism for use in the event of power failure as an option if required. Various control, actuation and safety systems to control the doors and provide a safer environment. In certain cases, manual operation is still available by self coiling (push up/pull down), tape recoil box or hand-winding box. Foam-filled slats are available in 40mm, 52mm and 77mm sections in various colours and wood-grain effects to suit your requirements. Extruded slats are available in 37mm, 55mm or 77mm sections and are Polyester Powder Coated White or Dark Brown as standard, or at additional cost in a standard/stock BS4800 or RAL range colour. The guide tracks and box can be colour coated to match (excluding wood-grain). 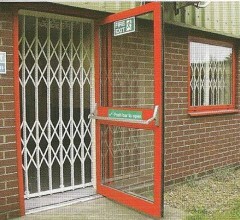 Collapsible Lattice Gates are an extremely versatile security product which when open can be very unobtrusive. They provide a high level of visibility whilst helping prevent intrusion, protecting you, your home and possessions from theft. They are manufactured from purpose made galvanised steel sections arranged vertically and diagonally to create a lattice work pattern assembly. The Gate assemblies run on heavy duty Nylon wheels within a 'W' section galvanised steel fixed top and bottom track. The gates are fitted with a 7-pin tubular key operated lock and finished in Polyester Powder Coat paint in a stock colour as standard. At extra costs, the gates can incorporate Lift-up Bottom Tracks (useful when installed to a doorway or corridor to prevent tripping), a Swivel-Aside facility (to swivel the bunch/es clear of the opening, perhaps behind curtains) and Adams-Rite hook-bolt dead locks which can be operated from both sides of the gate. If required, we are able to offer an alternative range of Collapsible Lattice Gates to LPS 1175 - SR3 where insurance may specify. Static Security Grilles are also designed to help prevent intrusion through windows whilst not compromising light and vision through the glazing. Fitted internally or externally, Static Security Grilles offer a high level of security and can be designed, manufactured and installed to suit your specific requirements. They are constructed from 16mm or 19mm solid steel round vertical sections continuously welded at 125mm centres to horizontal steel flat section or steel RHS. The whole assembly once manufactured is finished in Polyester Powder Coat paint in a stock colour as standard. 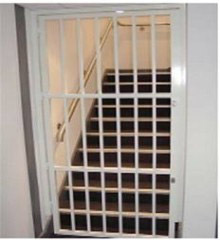 Hinged Bar Gates are generally Static Security Grilles with hinges and locks fitted consequently having the added feature of being opened/closed and are therefore ideal as added security to an existing door or a stand alone item. The standard lock fitted would be a Chubb 3G114 deadlock. Hinged Bar Gates are generally Static Security Grilles with hinges and locks fitted consequently having the added feature of being opened/closed. Fitted internally or externally, they offer a high level of security and can be designed, manufactured and installed to suit your specific requirements. They are ideal as added security to an existing door enabling ventilation through on a hot day whilst maintaining a level of security. They also allow full view of visitors before allowing access. They are also an ideal and effective security solution as a stand alone item, perhaps as over an alleyway between properties. They are constructed from 16mm or 19mm solid steel round vertical sections continuously welded at 125mm centres to horizontal steel flat section or steel RHS. The whole assembly once manufactured is finished in Polyester Powder Coat paint in a stock colour as standard. The standard lock fitted would be a Chubb 3G114 deadlock. 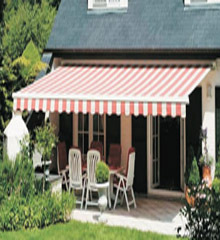 Sun Awnings extend your home into your garden, adding shade and comfort to your garden and patio area. Available in a wide choice of fabric designs in both solid colours or striped, the fabric is specially manufactured and coloured throughout and carries a five year guarantee against solar fading and deformation. A choice of optional front valance designs is also available to enhance the Awnings. In most cases they are operated electrically via a 240v single-phase electric motor with an extensive range of sun and wind controls, ensuring maximum performance for your Awning. Integration into home automation can often be achieved allowing Sun Awnings and Roller Shutters to be controlled from a single hand held control. Manual operation is also available where required. All of the profiles used in the manufacture of our Awnings are designed and tested to TUV standards to withstand wind loadings of up to 75mph. 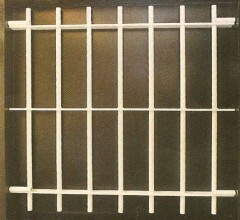 All profiles are fully finished in polyester powder coated white and brown with the option of a colour of your choice. An integral Water Drainage Gutter is included to help prevent unnecessary wear and tear/damage to the Awning.